In a large bowl, beat egg, water and oil until blended. Gradually beat in cake mix and flour. Divide dough in half. Shape each into a disk; wrap in plastic wrap. Refrigerate 2 hours or until firm enough to roll. Preheat oven to 350°. On a lightly floured surface, roll each portion of dough to 1/8-in. thickness. Cut with a floured 1-1/2-in. round cookie cutter. Place 1 in. apart on greased baking sheets. Bake 8-10 minutes or until firm. Remove from pans to wire racks to cool completely. In top of a double boiler or a metal bowl over hot water, melt chocolate chips and shortening; stir until smooth. Stir in extract. 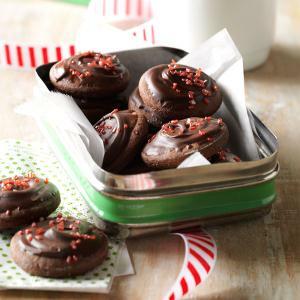 Spread cookies with chocolate mixture. Place on waxed paper-lined baking sheets. Decorate with sprinkles. Refrigerate until set. Makes 10 dozen.